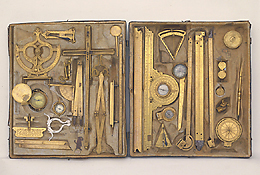 This box, a typical example of a co-ordinated set of mathematical instruments, contains numerous pieces in brass (25 in all) for different uses, divided into two levels which are subdivided into compartments. The instruments include squares and compasses, plumb-lines and graduated rulers, quadrants and numerous accessories. Some instruments are dated and signed, others are anonymous. All of the instruments are finely engraved, and made of gilt brass. They could be placed in different combinations with each other, giving rise to new instruments. It is probable that not all of the objects contained in the box belonged to it originally. Prince Mattias de' Medici purchased this set in Germany in 1635, along with the other instruments signed by Christoph Schissler and other German instrument-makers.